FIERCE Friday: Water Water Everywhere, but Which One to Drink? I love FIERCE Fridays! You guys send me the BEST questions! Here’s the one that I went with this week. Thank you for all of your awesome emails, keep ’em coming! Send your questions to dyan@getfiercetraining.com. FIERCE Q: What type of water would you recommend for drinking and efficient re-hydration of cells? A lot of times I simply don’t like drinking water from the tap and I know that it isn’t too expensive to buy a water filter of some sort. I find myself tending to more often than not drinking bottled water (especially Smart Water). I was wondering if you had any recommendations on which type of water you would normally have, and if there are thoughts on drinking bottled water vs. tap water. 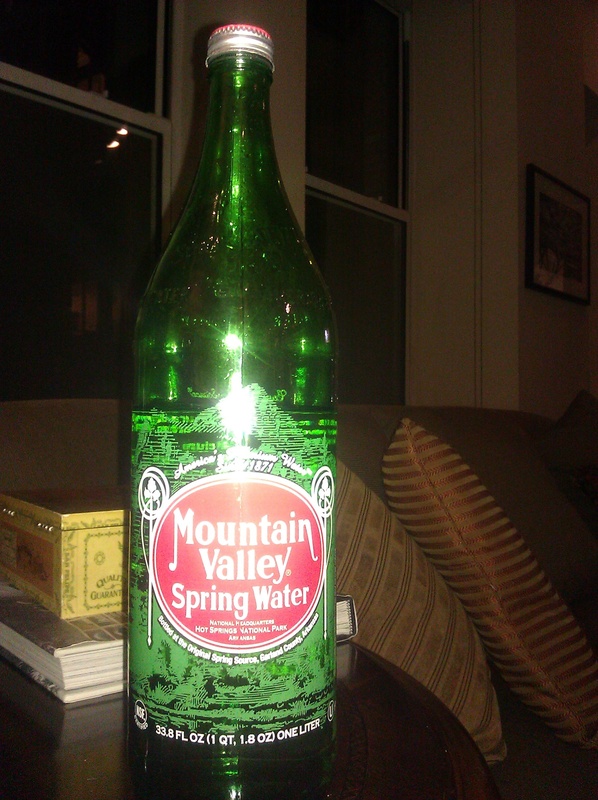 FIERCE A: I love Mountain Valley Spring Water! Not only does it have a super cool bottle and logo (check out the pic below) but, it comes in a glass bottle. I know it makes it a bit heavier to carry around (if you’re on the go like me), but it ensures a BPA free container for your water. Another reason I love MVSW is because of it’s pH. PH is a measure of the acidity or alkalinity of a food or beverage with neutral being 7 and acidity below and alkalinity above that measure. Many people believe foods and beverages with high or alkaline ph (over 7) are good for human health…Mountain Valley’s pH is 7.8. Lastly, I drink this water because it tastes AWESOME! I can’t get enough. To tell you the truth, I reuse my bottle. I buy a few liter bottles a week and refill with carbon filtered water (a la Brita from my fridge or the water ‘bubblers’ with built in filtration systems). This filtration helps to remove chlorine and other sediment from the water. If you’re a regular reader you know how much I talk about proper hydration. Keep drinking water, find out what’s the easiest for you, getting your own BPA free plastic bottle or what I prefer, drinking out of glass, and hydrate, hydrate, hydrate! This entry was posted in FIERCE HEALTH and tagged brita, fitness, health, hydration, water, water filters, weight-loss by GETFIERCE TRAINING. Bookmark the permalink. I’ve posted a couple of comments on your pages, and my first post, I made it seem like you didn’t know about hydration. That was my my intention. I was just commenting because I liked your post and wanted to comment. I say drink whatever water is convenient I even stop in peoples yards and drink out of the hose on long runs by myself. No, I didn’t take it like that at all. There’s only so much info to post in one blog. I appreciate your comments. I have a degree in Athletic Training and Exercise Science, but I’ve also been training for 10 years and have seen when people start out they can barely drink the generally recommended 8 oz 8 times per day. When your body is continually dehydrated it takes time for the body to begin the rehydration process, it’s like runoff in a desert. Of course drink out of a hose on long runs. I’ve run Boston twice and would stop and buy water from the hotdog man in Central Park when my water pack was gone during training runs. THe question posed here was what kind of water do I drink. THis of course does not work for everyone. I always say to know your body, it’s all about finding what works for YOU.